The chef Ranga was the best!He made every dish with a lot of Good taste and with a lot of effort. The fish and tunasalad at lunch and dinner and the fried pancakes with vanilla and cinnamon at breakfast. 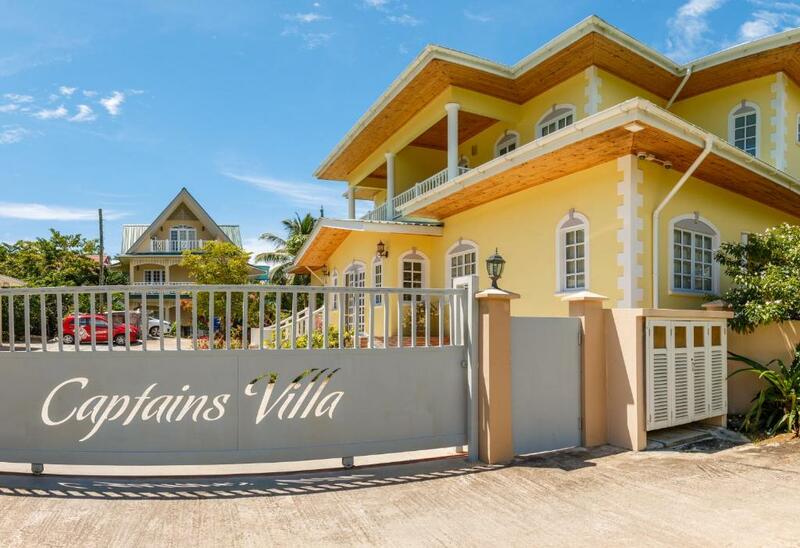 Captain's villa is actually finer than in the pictures. We had a lovely stay at Captain's Villa. Flo and her Sister were very helpful with everything to gove us a comfortable stay. We got 2 complimentary brekfasts. The accommodation is near the bus stop 27 mins away from the airport, the facilites are great and the hosts are very friendly and accommodating. The Chefs too. The staff were great in general. 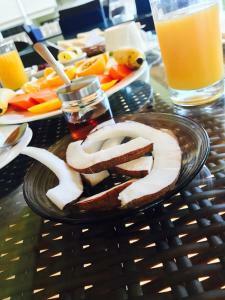 Thank you for making our 10yr Anniversary trip to Seychelles a memorable one and for the complimentary breakfast. Just confirming all the good stuff from other comments :) Hosts are incredibly welcoming and helpful, food (buffet dinner in our case) was excellent. Also location was peaceful and close to the beach. The property is perfectly tailored to meet all possible requirements of a tourist wanting to unwind and relax. INCREDIBLY friendly and helpful staff, lending us a hand with fine-tuning every aspect of our stay with a friendly smile and a caring demeanor. Delicious breakfast. Very clean rooms. Staff is very polite and always there to help. Location is perfect, one of the most beautiful beaches is just in front of the villa. There is a small shop, hilton hotel and surfers restaurant beach nearby (within walking distance). Also, we got 20% discount for DoubleTree Hilton hotel restaurants and bar during our stay. I would suggest getting a car for a 2-3 days so you could visit other places and beaches such as Takamaka, Anse Petite etc. The hosts were very friendly and helpful. They made sure we were comfortable and also provided us with all necessary guidance to explore the island. The rooms were clean, well maintained and had good facilities. Next to a beautiful set of beaches on the south east side of Mahe. We stayed in the new building, which was beautiful and incredibly well kept. Our room had a veranda with chairs outside where we had our breakfast every day. There's car rental available from the hosts at a good rate. This part of the island is quiet and there is easy access to some of the best beaches with a few minutes drive. The staff were incredibly friendly and helpful, always greeted us with a smile. We were here for their new year's dinner and party which included both their family and the Villa guests and was great fun. It is hard to imagine staying anywhere else on Mahe. We like the location very much, far away from hustle and bustle. The air is cleaner than downtown. Close to the Takamaka area, au cap, Anse Royale which are all amazing view without many tourists. And the room is good for family stay with kitchen also. Amazing location, beautiful beach right outside the villa! 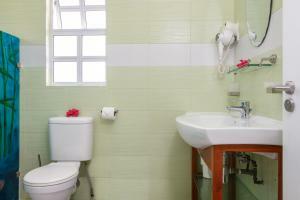 Top cleaniliness standards, spotless housekeeping work! Safe and quiet area, hosts are genuine. Breakfast is a must-try. Go outside by night and have a look at the sky! Lock in a great price for Captain's Villa – rated 9.2 by recent guests! One of our top picks in Takamaka.Captain’s Villa is located just 150 feet from Anse Forbans beach on the Southeast coast of Mahe, between Anse Royale and Takamaka. Guests can enjoy snorkeling to discover the rich sea life in the area. 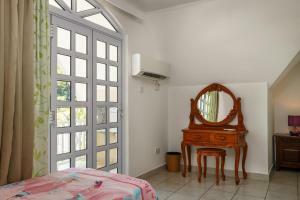 Captain's Villa offers both guest house and self-catering accommodations options. The Family Suite and Two-Bedroom Suite offer self-catering facilities, while the guest house, in a seperate building, offers family and standard rooms. 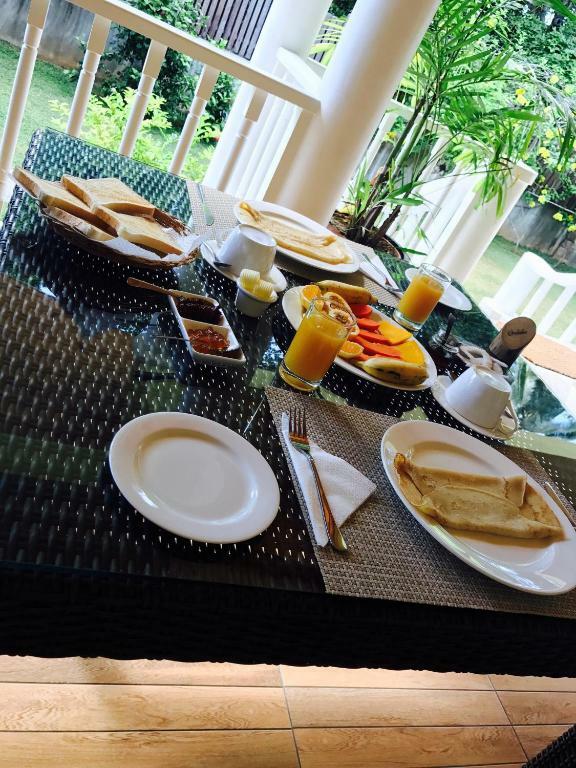 Breakfast is optional and available on request at Captain’s Villa. Grocery stores and restaurants are found within walking distance and more can be can explored within 3.7 mi from the Villa. Free parking and WiFi are available. Car hire and an airport shuttle service is available. The Seychelles International Airport is 6.8 mi from the property. When would you like to stay at Captain's Villa? 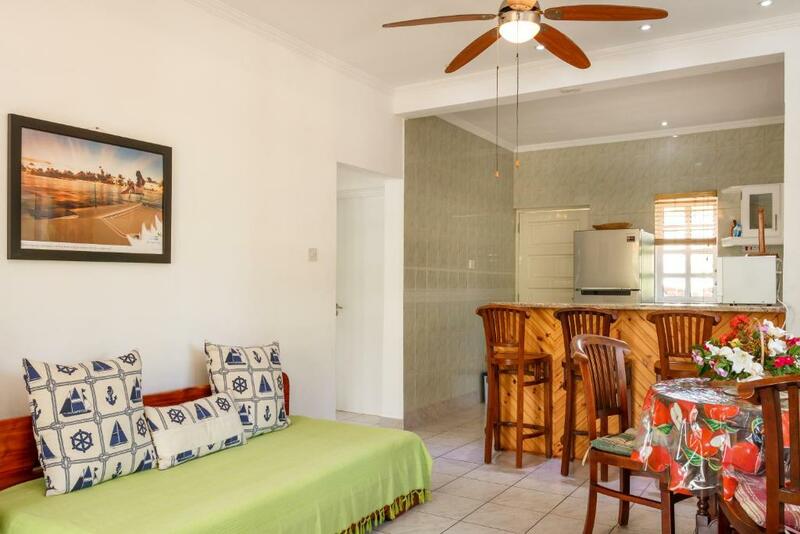 This self-catering suite is located on the ground floor. It features a terrace, fully equipped kitchen and an open plan sitting/dining room. 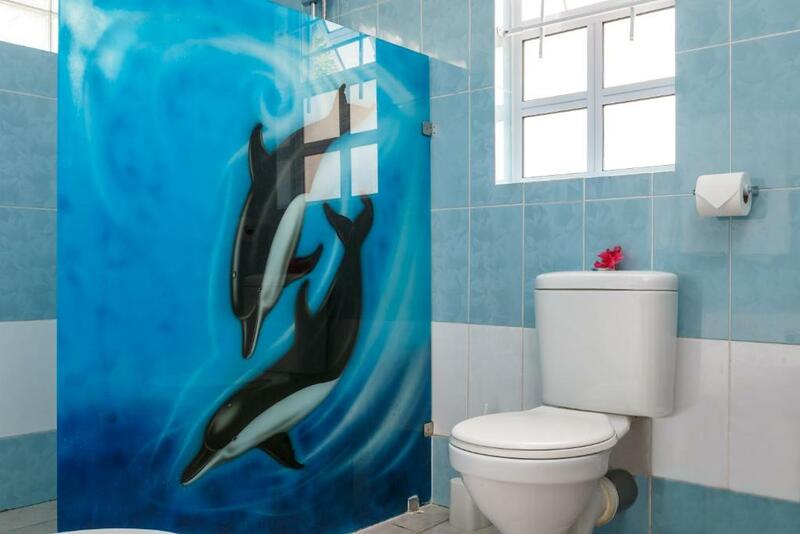 The private bathroom includes a shower and free toiletries are provided. 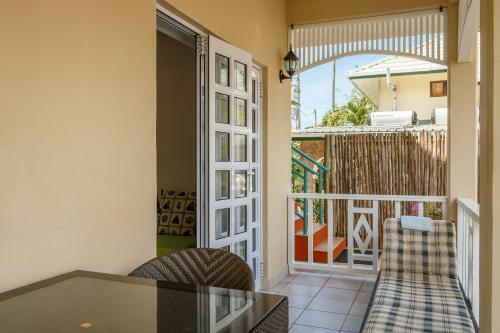 Located on the first and second floor, this self-catering suite features a terrace, fully equipped kitchen and an open plan sitting/dining room. Each bedroom has a private bathroom with a shower and free toiletries are provided. This spacious family studio comes with a queen size bed and a single bed. It is equipped with a fridge, kettle, safe and has its own private balcony. Free WiFi is available. This double room has a queen size bed, fridge, electric kettle, safe and opens up to private terrace/balcony. This twin/double room has 2 single beds and can be prepared separately or made up together to become a King size bed. It can be access from the reception/lobby and also from a private veranda entrance. The room is equipped with a fridge, kettle, safe and TV. Free WIFI is available. House Rules Captain's Villa takes special requests – add in the next step! One child from 3 to 12 years is charged EUR 15 per person per night in an extra bed. Captain&#39;s Villa accepts these cards and reserves the right to temporarily hold an amount prior to arrival. Captain's Villa accepts these cards and reserves the right to temporarily hold an amount prior to arrival. Captains Villa is like coming home - when you enter the house, you can feel the relaxing atmosphere. Everything is so beautifully decorated and very clean. But what makes it so very special are the people. Everybody is just so lovely and friendly :) A big plus was also the food - so tasty and a very good quality, not expensive. We did not want to eat anywhere else. A highlight for sure was that we got the biggest fish ever. Oh and the beach which is just opposite: the best one! Had sunrise coffee every morning. Thank you Captains Villa team for these memorable 4 days! Service charge for breakfast should be included in the total hotel cost which would help in lesser transactions. Breakfast was amazing with fresh fruits and honey right from the garden. Hosts were very friendly and the rooms were extremely clean. Can not think of anything major. Though there was no swimming pool but we had access to use Hilton's pool near the accommodation. Nice staff, nice dinners, clean and modern guesthouse. Extremely helpful and attentive staff, excellent food (including breakfast), spotless and comfortable rooms, and a very short walk to a beach. Wish we could have stayed longer. The owner was very kind, rooms were clean and new, nice terrace for breakfast, parking place. 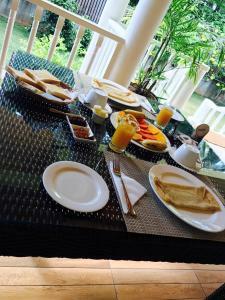 The breakfast included local fruit (from own garden), toast bread, jam, eggs or pancakes, butter, coffee, tea, juice. Basically similar with other accomodations we had on Seychelles. The house is just amazing, super clean, comfy and everybody is super welcoming and helpful. The food is delicious and definitely worth the money. The beach is just across the street, super quite. Over the road from the beach. Spotless rooms. Lovely staff. The hosts were welcoming and extremely helpful and caring. The food at the villa is amazing too. They have a great chef who makes the most amazing meals if you choose to have dinner there. 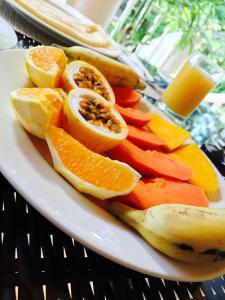 Breakfast and coffee were good, with fresh fruit from the area. The beach is a stone’s throw away and the villa is set amidst beautiful lush forest. The place is gorgeous! The guest house is a short walk from the nice beach and the friendly hosts give you good directions on shops, etc. They had a nice bonus: you receive a pass that will let you enjoy 20% discount on foods and drinks at the nearby Hilton hotel + lets you enjoy their pool. The person that checked us in failed to inform us that we could get a 20% discount at the double tree near by and we Ayer there on several occasions without the discount. Very clean, friendly and safe. Close to beach, really friendly staff. Indian guys are super friendly. Clean and spacious room.